Designed to get Impossible! Universal tire off-road class MT (Mud / Terrain) from Federal. The demanding field trips, mud, snow, on the stones, rocks and gravel. Available in popular sizes, fits the majority of off-road vehicles. 2. Confidence unchanging performance in the mud and sand, which gives increased ability to self-cleaning tread. A uniquely designed specially graded paving edges of the tread and further shaped groove of the cavities are effective in promoting the process. 4. Traction, power and control in the field - with deep grooves between the tread blades. Taking place on the wall of the tire tread ribs, lower and higher alternately, you better grab terrain in the deep ruts and help in the mud. 5. Confidence, control and traction on the road - through the middle of the flat part of the tread, with well-designed detail central blocks with a unique shape. 6. Longer service life, resistance to cutting, abrasion, tear and puncture. Thanks to the special formula tread rubber compound. On the road without worry! Tire FEDERAL Couragia MT has the full approval of road P.O.R. (P.O.R. 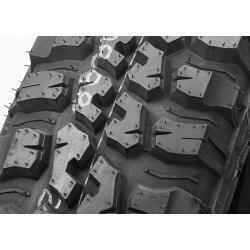 means a tire terrain for professional applications (Professional Off-Road)). 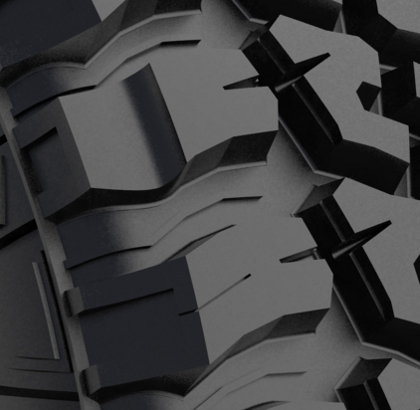 Meets exacting standards for off-road tires allowed on public roads.